Capital Guardians pedigree is consumer-directed. In its beginnings in the early 2000’s customers registered to maintain oversight of the personal expenses of an account holder, in a residential facility. Subsequently, all report design is consumer lead and kept things ‘simple’. “Less is more” is what drives our innovation. 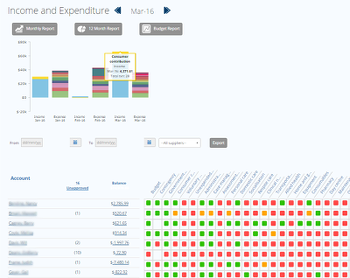 Our reports tell a story in a glance and require little or no training. As an added benefit, they add significant value to our organisational clients, whose staff use our system to manage hundreds of client budgets and expenditures. New clients do not believe that training takes 3-10 minutes, unknown in the software industry, and making Capital Guardians implementations possible overnight. 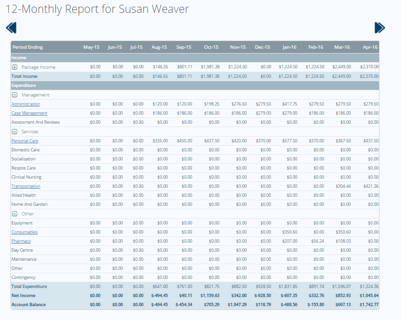 For all services, a deep level of “real-time” reporting is presented for the account balance, budget and transactions. All reports are accessible through login access on any internet enabled computer. They offer “drill-down” abilities, right down to individual transactions and a pdf (printable digital copy) of the actual statement or invoice. Our core report comprises our simple statement. With a design familiar to that of decades of paper-based bank statements and a one-click audit reporting system, we deliver through to payment. 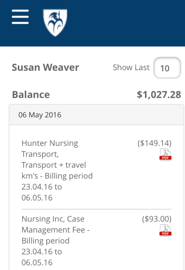 You also receive detailed breakdowns of invoices within pdf files and have the ability to export on mass and sort any column as desired to print. ……. 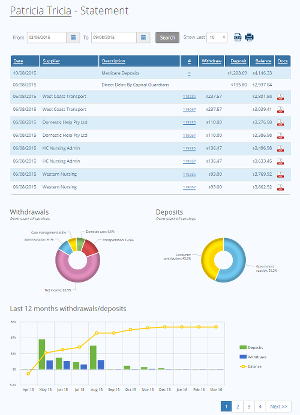 or a detailed monthly report can be viewed. 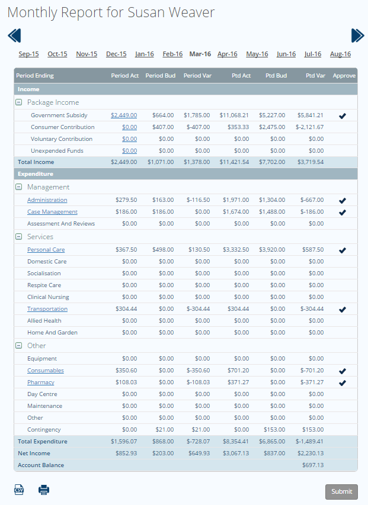 Detailed monthly reports include variance reports (actual compared to budget, and the variance). Report access is provided free to the HCP Care Managers and care recipients (and any number of authorised representatives/advocates/guardians, etc). Its these reports with their real-time transparency that give Capital Guardians governance credentials. They are well above any alternative management options. Getting back to our “consumer” credentials, all these reports are available on any type of smartphone or tablet and optimised for oversight and approval on the move.